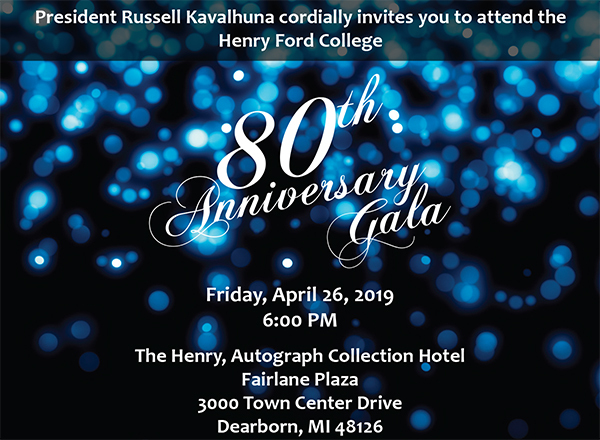 Henry Ford College President Russell Kavalhuna cordially invites the campus community and the public to attend the HFC 80th Anniversary Gala at The Henry, Autograph Collection Hotel in the Fairlane Plaza at 3000 Town Center Drive in Dearborn, Friday, April 26, at 6:00 p.m. Proceeds from the gala directly support essential scholarships and grants awarded to our students and faculty. Please join us for a magnificent evening. For more information, contact Stacy Bazman at 313.845.9620.